Hard plastic front pressure release knob for Across International pellet presses. Pressure gauge for Across International's MP15 15-ton pellet presses. Sealing gasket set for Across International's pellet presses. 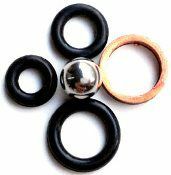 Each set includes three silicon o-rings, one copper ring and one 6mm diameter stainless steel ball. 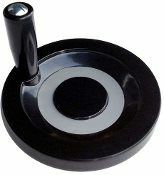 Replacement top turnplate with detachable handle for Across International's pellet presses. Thermocouple with connection cable for Across International's 1/2", 1", 2" and 3" diameter cylindrical heated pressing die sets. Comes with a stainless steel cover to protect the thermocouple. Hard plastic rocker front plastic handle for Across International pellet presses.